ALPS Mountaineering's Explorer + XT is going to have all your friends jealous at the next outdoor event. If you're headed to the kid's games and have to sit on cold, hard bleachers for an extended period of time, you know how important padding and back support can be. With the Explorer + XT, you get 2Â¼ inches of thick padding to sit on, and a backrest to lean back against. ALPS Mountaineering &apos;s Explorer + XT is going to have all your friends jealous at the next outdoor event. If you&apos;re headed to the kid&apos;s games and have to sit on cold, hard bleachers for an extended period of time, you know how important padding and back support can be. With the Explorer + XT, you get 2Â¼ inches of thick padding to sit on, and a backrest to lean back against. What&apos;s even better about the Explorer + XT is that it also functions as a backpack so you can keep your hands free when getting to your destination. The side mesh and buckle across the top hold your gear inside the seat. It&apos;s easier to get your suntan lotion, water bottle, blanket, and book to where you&apos;re going when you can just throw it on your back. Then when you get to your seat, you&apos;ve got everything there with you (plus a cushion to sit on!) 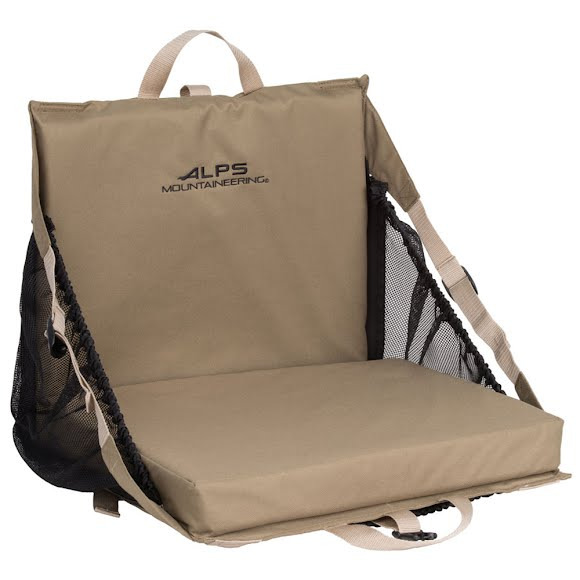 There&apos;s an additional pocket on the bottom of the seat that works great for hauling magazines or programs. This seat also works great on the ground to protect you from the dirt, at the beach to keep you off the hot sand, and also when hauling a heavy chair a long way is undesirable.